Does Hearthstone’s expansion cost too much? I do not play Hearthstone. There’s a very simple, good reason for that; it’s digital crack, and I actually have a family to care for and a job to do. If I did play Hearthsone, I’d have to do it from an unemployment line. The very free, and by all accounts very awesome card battler is getting an expansion soon by way of Curse of Naxxramas… and its pricing model is getting up some people’s noses. Yesterday, Blizzard detailed exactly how the expansion is going to work, and how users will be expected to cough up for the content. Blizzard will be releasing one wing of the new adventure each week – and as is typical for a crack dealer, they’ll be offering the first hit for free for the month after release. Each successive wing of the expansion will cost players 700 of their hard-earned in-game gold. For a decent player, that’s about a week and bit’s worth of grinding. Of course, because it is a free to play game and Blizzard is in the business of making money, they’re giving players the option of just buying the new content outright, using real-world money. 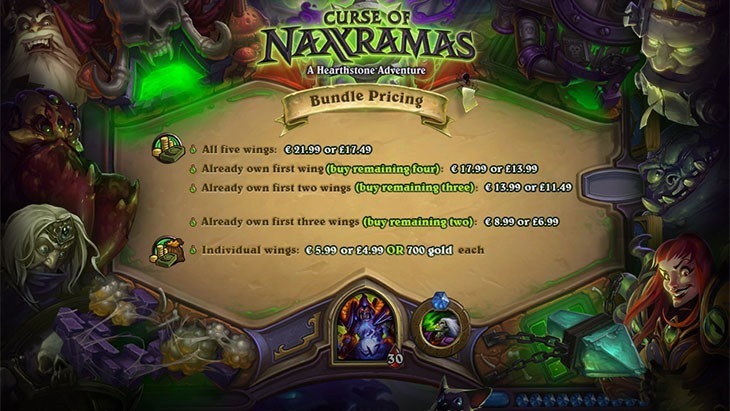 Each wing will cost $6.99, 5.99 EUR, or 4.99 GBP; a sum that some feel is too much for slices of a campaign that eventually totals to just 30 new cards earned from the whole thing, discounting the fact that it offers a wealth of single player content, plus a guaranteed Legendary card from defeating each wing’s boss. From my perspective, this seems like a pretty good way to monetise the game; you can either pay outright, or spend a bunch of time playing the game to earn your way to the next wing – but not everyone feels that way. What do you think? Is this the right balance for F2P, or is Blizzard being a little cheeky?